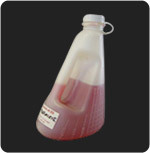 Range of 200ml - 500ml or 1/2 - 21/2 cups. Excess powder gently shaken off and away from the user. Excess powder flows away and leaves what is required. Locks on powder contact. Rinse to unlock. How do you set the quantity? Turn the inner cup so it slopes up to the calibration mark on the right hand side that you wish to measure. Doesn’t all the powder flow out the hole on the side? The powder flows out the side port and stabilises at the mark on the right hand side. The calibration takes into account the amount that flows out the side port. Is the Ezi-action® Powder Measure accurate? The Ezi-action® Powder Measure enables an accurate quantity to be measured not estimated. It has been found that wastage or overuse can be as high as 20-30% where a scoop is used. What is the Ezi-action® Powder Measure made of? 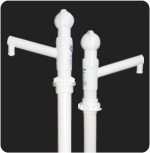 Made from durable and flexible high grade, chemical resistant polyethylene but it is not designed to break up lumps of air hardened powder. What are the safety features? Shaking the excess powder away from the user reduces powder exposure. Locking on contact with powder provides confidence that the set quantity will always be used. 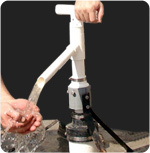 It can be reset by simply rinsing with water and drying before use. 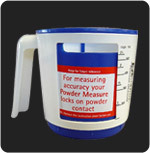 Colour coding of the inners will differentiate the Powder Measure to a specific chemical powder. 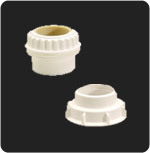 White inners are suitable for food applications. Can the Ezi-action® Powder Measure be personalised? Can be branded with your company / product name, logo. Inner cup can be cutomised to your colour. 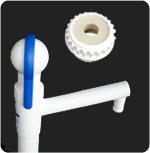 Can be calibrated to suit the bulk density of your powder. Customisation will help customers remain loyal to your brand. Branding makes a statement about the quality of your product and helps command a higher price. Why offer the Ezi-action® Powder Measure with your products? As a marketing tool it enhances your main line of business. It is ideal as a give away or half price promotional offer for adding value when you launch a product or want to increase market share. It can be promoted as part of a total health and safety package to prevent wastage and overuse. If you’d like to work with our sales team in your area then please Contact Us.